When the SNES was released in the early '90s, the concept of online play was very much in its infancy. PC gamers had dabbled with crudely beaming data over telephones in the '80s, and despite some notable attempts to replicate this on consoles — such as X-Band and Nintendo's own Satellaview service — there was never any real "online gaming" as we know it today on those systems. However, two German hackers have created SNESoIP, an open-source venture which finally allows you to play Super Mario Kart and Street Fighter II against SNES players in other parts of the world. Because SNES games don't have any online functions built into them, SNESoIP has to connect to the joypad port and them beam the inputs across the web to the other person's console. It's a simple yet ingenious solution for a problem that Nintendo's designers — and developers of the period — could never have predicted would exist. Let us know if you've tried this, and share your thoughts below. On the basis of it reading button presses and sending them online. Wouldnt any console work? Nes and n64,would surely work on the same technology?!? @Rief Pointless things can still be beautiful. I'm amazed these guys devoted the time to figure this out. I would pick it up even if it only meant using it once just so I could. I think I've only played the first Mario kart solo. I didn't have brothers or sisters and having a friend over was a big ordeal. It's good that they try this but kinda pointless now that people are more into modern shooters and stuff on the modern consoles. The only way to have fun with this thing is if you can force all your friends from back then to gather again and buy this thing for their Super NES so to relive those young moments again. @sleepinglion Right! They do that with wii sports why non with VC games? @Rief @retro_player_22 Plenty of people - myself included - play just as much on retro hardware as modern hardware. I'd be all over this, especially for games of Super Tennis! @faint: I agree. This is an awesome idea, at least until Nintendo has online multiplayer for the SNES VC. Everyone talks about the impact on sales of mobile gaming and the Ouya and Steam on new consoles, but I wonder how much of it has to do with Retro gaming and people still happy to play on their SNES's, Megadrive's, Gamecube's and PSone's? I mean, I showed my SNES to my nephew the other day and we played on it for a couple of hours, but then it went back in the bottom of the cupboard. It astonishes me people still regularly play Ocarina of time on the N64, or Smash Bros on the Gamecube. Surely any game has a limited appeal? "Very ingenious but as you will see on this video playing "Zombie Ate My Neighbours", the biggest problem is that both games are independent from one another, thus the enemies you see in SNES 1 are not the same on SNES 2. There are games where this will be a non issue (like "Street Fighter 2" versus or multiplayer "Bomberman" if you don't mind power ups spawning differently) but it will not work very well on most. Yet, I could not but smile with the cleverness of it all. But some multilayer is best played with friends in the same living room and with the SNES this is indeed very much the case." @Shiryu That's a very good point, and something I hadn't considered! The games in question need to be calibrated perfectly and that isn't always possible. My thoughts exactly. It works only when a game does not apply randomness. Even then you may cope with synchronization problems. This would only work if the video of one of the consoles is also transmitted for display on the external tv. Other than the technological part of this, for myself it would not be really interesting. If I got one of those, I'd play my Super NES every day, all day. Such a simple solution... props to the guys who made it! @Smooch @Damo The solution has been achieved about a decade ago using things we don't talk about here. I suddenly really want to do this. I'd love to try this. The simple thought of it all blows my mind. Any hopes for more information on the device? Or is that too much to ask for? Hey, that's pretty cool! I wish I could set this up, and try out some other games on it as well (though I'm all for some Super Mario Kart). @sleepinglion VC games would have to be jacked up in price to match the extra programming required. @element187 dude, you hit the nail right on! Now if we can have online N64 games like F-Zero, Smash Bros, MK 64, I will give them my bank account. @Damo How does it work if one person is using PAL and the other NTSC or somebody is using the PAL cart with a 60hz modded SNES ? @unrandomsam But this is Nintendo we are talking about. Brings me back to the days of playing SNES. Now this attachment here brings online to your living room. Awesome. I think this is awesome. A lot of people may just say, "well bring the games to the virtual console and there wouldn't be a need for something like this". to that i say, nay. the advent of the VC is fantastic. 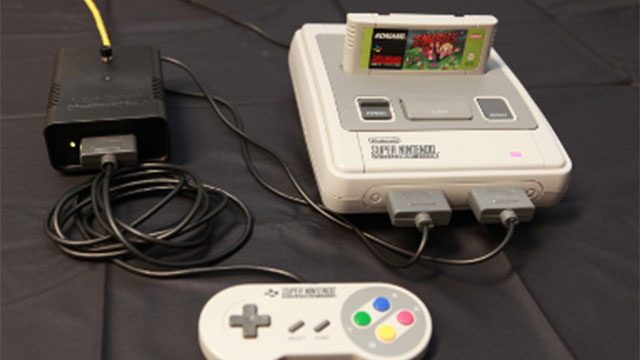 it allows you to play your classic games without the frustration of old carts, or bad connections (to name a few). the problem though, is that part of the retro experience, is actually experiencing the game on its native console, with the original controller, and the original graphics. (fuzzy or not). so being able to pick up an snes controller and doing battle will always win out over a VC release. for me at least. I love this idea. @ULTRA-64 What a lot of people don't realize is that it's not just as simple as transmitting the button press over the internet, but also synchronizing the games' timing as well as memory, randomizer seed values, accounting for latency and adjusting accordingly, etc. @element187 Hence why I expect better. For the price it should be the best you can get period. (Including all options that exist). Either that or less cost. If Sega release an official Saturn style controller for ios7 and support it with everything they have then I think they will have the best setup for the ipad. (It is 4:3 and has enough pixels to not mess it up like Nintendo did with the DS support for the 3DS). 3:4 games by just fliipping it around. (Never owned an ios device up to now don't really want to but I would be stupid not to for these games. No more locked down than Nintendo. I won't use any of the other stuff on it just playing retro games). Think they are other things at play as well. Super Tecmo Bowl III anyone? I used to have xband, that was expensive, i wanted to play someone at nba jam te but no one ever connected, i paid like 30 bucks a month and never got to play, what a rip off. I love this idea, but I wouldn't go to the trouble to set it up. Not only is the non-synchronization of the two games an issue, but I feel like online multiplayer feels best with 4-20 people, and on top of that I don't see a lot of people using this. After all, I think people seldom use Warppipe or other such tunneling software to play LAN-compatible Gamecube games over the 'net. Oh wow! This is awesome! Retail that thing! I don't even want to think of that kind of nightmare. The reason Nintendo hasn't done this is because you can't just hack something together like this and expect it to work online. You have to change the games to add prediction and error handling, you don't just wave a magic wand and every game suddenly works. For example, if the network hiccups for even a few seconds during a Mario Kart match, what should the emulated system do? Assume the player is not pressing anything and send their kart careening into a wall? What then happens 2 seconds later when the correct inputs are belatedly received? Suddenly your game is out of sync. The correct handling is for the program to presume that the player will continue to press the same buttons as they were during the "last known" good packet, then when the correct packet is received with their updated position, it needs to be prepared to adjust their kart to where they now are in reality. No games made for the NES/SNES have code that is prepared to handle these occurrences. All this device needs is to send the output sound & video from the master SNES unit over the 'net to the slave controller box. There's no need to use two Super Nintendo units if the video and sound are transmitted back to the person who had the slave box. Syncing is also an issue with using other methods to play multiplayer SNES online. I don't see why it's so hard to do! Just pipe the audio/video; don't try to sync the source machines! I still dream about playing Starwing co-op online. @MrGawain I doubt retro gaming is having a huge impact as I think some of those are gamers who are generally uninterested in modern consoles anyway aside from the ability to, perhaps, download older and retro-inspired titles. I was a lapsed gamer several times and now consider myself in the retro-gaming camp. The modern consoles and the experiences they provide don't appeal to me so I'm not a customer. Download services aren't bad, though I've found the Wii and its Virtual Console deficient in several areas that affected my enjoyment. And it is a big investment to buy a modern console just for retro game downloads.